Leyland Cypress is a most useful and beautiful hybrid "super tree"! 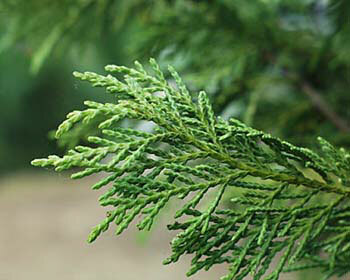 It is an upright evergreen conifer that can grow to more than 100 ft (30.5 m) in height. In Great Britain individuals reaching more than 130 ft (39.6 m) are reported. In most areas of the United States, however, Leyland cypress usually maxes out at half that height. It is very symmetrical and assumes a pyramid or columnar shape. The needles are overlapping and scaly and are assembled into flattened sprays that densely cover the upward curving branches. The Leyland cypress is a fertile intergeneric hybrid that was created in 1888 on the Leighton Hall estate near Welshpool, Wales in Great Britain. Normally hybrids are possible only between species within a single genus. This plant is interesting as it is a cross between species of two different genera. Several varieties of this hybrid are available, the parents in all cases being the Monterey cypress (Cupressus macrocarpa) and the Nootka cypress (Chamaecyparis nootkatensis). The most common variety is from the original cross of a male Monterey Cypress and a female Nootka. It is known as 'Haggerstown Gray' and has foliage which is sage green above and light gray-green below. It was named after the estate owner's brother-in-law, C.J. Leyland, who planted the new hybrid at his home, Hagerstown Castle. Some years later another cross was performed involving a female Monterey and a male Nootka. The result was a narrow columnar form with rich green foliage called 'Leighton Green'. Other varieties include 'Naylor's Blue' which has bluish foliage and the colorful 'Castlewellan' whose new growth is bright yellow. Both of the parents of this hybrid are native to the North American Pacific coast. The Monterey cypress (Cupressus macrocarpa) is native to the coastal regions of Northern California. The other parent, Nootka cypress (Chamaecyparis nootkatensis) is a native of the Pacific Northwest - Leyland cypress most closely resembles this parent. This tree is a very robust plant that is happy in just about any type of soil except for those that are constantly wet. Light: Grow in sunny conditions but will tolerate shade for part of the day. Moisture: Provide average water for fastest growth. Leyland cypress can survive with little water for extended periods of time and is, in fact, impressively drought tolerant. Propagation: Unusual for an intergeneric hybrid, this tree sometimes produces viable seeds. However cuttings are normally used for propagation so that the parent tree's characteristics are maintained. This fast growing evergreen is as versatile as it is useful - especially when you're confronted with large areas of bare earth (a situation frequently encountered by new home buyers). This tree is the solution to quickly creating cool areas of greenery. The dense foliage of Leyland's cypress and its habit of retaining branches to ground level make it the perfect candidate for screens and windbreaks. It is great for informal hedges or can be sheared to create a more formal look. If you do use Leyland cypress for hedges be aware that this is a high maintenance relationship as this fast grower must be trimmed or sheared at least once a year. Neglected hedges of Leyland are overgrowing Great Britain! Some hedges reach over 80 feet shading out neighboring vegetation and occassionally falling with sometimes disastrous effects on property. 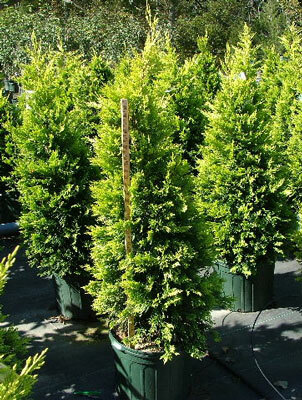 Leyland's cypress is often sold in containers as "live" Christmas trees. These are especially popular in the southeastern U.S. where more traditional cut trees are either unavailable or too expensive. If you have the space, buy a live Leyland cypress Christmas tree each year to plant outdoors. In just a few years you will have a beautiful grove of evergreens. For a natural looking grove, start in the middle and make successive plantings in a pattern radiating out from the original tree. Leyland's cypress is also great for containers - at Disney World these are shuffled about to provide "instant green" and to screen unsightly views. 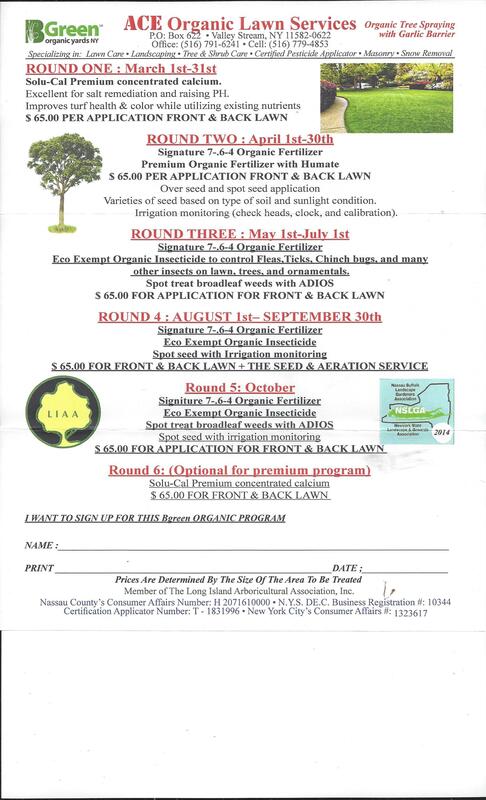 We highly recommend this tree for its beauty, ruggedness and resistance to pests and disease. It is very tolerant of drought once established and has some salt tolerance. It is also inexpensive and fast growing - I have had young specimens grow more than 4 ft (1.2 m) in one year! Plants that combine all of these traits with a fast growth rate are rare and much appreciated.